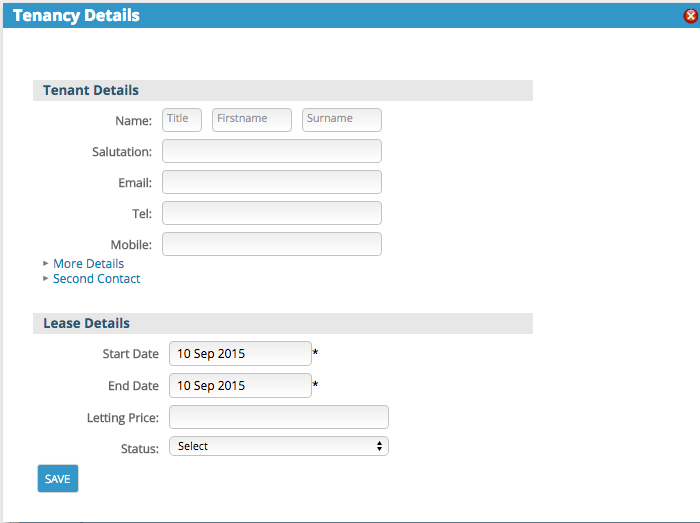 Letting properties have a Tenancies widget to enable the recording of each separate tenancy. Each tenancy has its own document store to allow uploading of associated documents. In the property details page, find the Tenancies widget and click the “Click here to add a new tenancy” button. Fill in the name and address fields of the tenant. You can expand the Second Tenant section if this is a joint tenancy. Creating a new tenancy adds a new contact record for the tenant. Enter the lease details and save the tenancy. Below the property summary box there is a Tenancies tab. Clicking this reveals a list of all past and current tenancies. Clicking the tenant’s name in the Tenancies list takes you to the details of that specific tenancy.